Galaxy Icon A portion of the Starting Planet and several floating clouds. 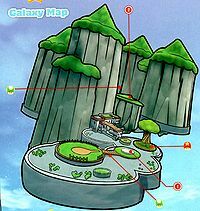 Fluffy Bluff Galaxy is a galaxy appearing in World 1 of Super Mario Galaxy 2. The Cloud Flower and The Chimp are introduced in this galaxy. It is also known for its many Octoombas. Prankster Comets will not appear in this galaxy until the Green Stars are unlocked. Mario approaching the Starting Planet. Concept Artwork of the planet. The Starting Planet is easily the largest planet in the Fluffy Bluff Galaxy. It features a large expanse of land and multiple grassy stone mountains. This planet also has a large pond of water and some small buildings and gardens with flowers and trees. A tree on a small island can be seen near the starting area, on the top of which is a Sling Star leading to a large cloud and a Hungry Luma. From here, if they still have clouds left they can Long Jump straight to the Stone Mountains Planet, bypassing the Pond Planet altogether. Next to the base of the tree is a Warp Pipe that leads the player to a secret area where they must collect a ? Coin, followed by more regular coins in various different formations. Near the middle of the planet lies a wide valley, at the center of which is a black hole. Several clouds floating over this valley can be used as platforms to successfully reach the other side. At the end of the valley is a small field and a cliff face composed of planks, which the player must Wall Jump up to reach the Launch Star at the top. Cloud Flowers appear prominently on this planet, which is where they are first encountered. Flaptacks and Elite Octoombas are prominent in this area. Mario on the Pond Planet. This small planet is covered by a large, shallow pond of water. There is a small piece of grass on one of the planet's sides of and a wood platform on the other side. A Cloud Flower can be used to find a Comet Medal floating, underneath it is a metal spike. Scattered around the planet, there are five Star Chips that must be collected to reform a Launch Star over the platform. This planet is also inhabited by Cosmic Clones that mimic each of Mario's actions. A section of the Stone Mountains Planet. This large planet, very similar to the starting planet, has a rectangular piece of grass and a cliff of dirt that the player must climb to get to the upper part where they can find a field with a pond and some large trees. Far away from this piece of land, there is a set of floating rocky mountains with grassy tops that can only be accessed with the clouds spread in the air. A black hole is found in the middle of the two lands. There are some rising clouds as well as Bomps. Mario jumping up the Cloud Tower Planet. This planet can be reached by feeding a Hungry Luma 100 coins on the Starting Planet. It is a very tall triangular tower with clouds and platforms. The player must use the Cloud Flower to reach the top. Additionally, the player can go to the other side of the tower which contains coins, two 1-Up Mushrooms, and a Sling Star that sends the player to the highest area with coins and a Cloud Flower. A replica of this planet appears in the Chompworks Galaxy, but there is a Spring Mushroom provided to get to the top instead of a Cloud Flower, making it more difficult to reach the top. The Tower Planet is the home to the only Secret Star in Fluffy Bluff Galaxy. This mission's objective is to find the Toad Brigade Captain. This mission's objective is to beat The Chimp's high score of stomping Goombas. This mission's objective is to feed a Hungry Luma and climb a tall tower. Mario under the first Green Star. The player will redo the Search for the Toad Brigade Captain mission. Green Star 1 is directly above where the player starts, and merely requires the use of a Cloud Flower to reach it. Mario about to grab the second Green Star. The player will redo the Search for the Toad Brigade Captain mission. Green Star 2 is located high above the small water pond across the second bridge. The player can reach the star with the aid of the nearby Cloud Flower, but has to be wary of the shallow water. Mario with the final Green Star in sight. The player will redo the Search for the Toad Brigade Captain one last time. The final Green Star is located on the stone mountain to the left of the one that The Chimp is on. Fluffy Bluff Galaxy - Fluffy Bluff Galaxy theme (full version) Shares music with Cloudy Court Galaxy. The Pond Planet was originally going to be a lot smaller than its final appearance, as shown in the E3 2009 trailer. By using a Cloud Flower and long jumping off of the cloud above the big tree, it is possible to reach the Stone Mountains Planet without using the Launch Star. This page was last edited on November 21, 2018, at 06:19.